In today’s time, many people cannot imagine running a business without the aid of technology, and the evolution of technology has changed the way we do business on a daily basis. Computers, software, apps, video, etc. have allowed companies to expand their businesses well beyond the borders of their home base. For factoring, it has created endless possibilities for how and where business can be done. In the late 70’s early 80’s as factoring was just coming to light as one of the newest options to assist businesses with cash flow, everything, for the most part, was done by hand, limiting the amount of business that a factoring company could take on. Because computers were relatively new to the business world and incredibly expensive, many companies used what they knew best, pen and paper. It took hours to process schedules, write checks, post payments and create and sign contracts. Face to face time was not lacking and allowed companies to build relationships with their clients, but it limited the number of clients one could take on. As technology advanced, the factoring industry began to explode. Software programs began to take the place of pen and paper, allowing for more information to be processed faster, giving companies the ability to take on more clients. The use of email was a game changer for all industries. Faster communication with their clients created an avenue for growth. While face-to-face time is often lost, factoring companies could now expand their factoring efforts across the US and beyond. Online banking has given clients the ability to be funded immediately, right into their bank accounts. Social media has given the freedom to advertise and reach mass markets reducing marketing budgets. Technology is an ever-advancing force that will continue to allow companies and industries to push beyond what they ever thought was possible. Factoring has grown exponentially and will only continue to reap the benefits that technology has to offer benefiting small businesses across the world. While technology has its positives and negatives, in the world of business, it’s again for everyone. Small business finance can be confusing for many startups. Properly setting up your financial books is vital for the success of any small business. Accurate bookkeeping will help you better manage your resources, find strategies to minimize debt and forecast economic trends to help you make the most returns from your investment. Additionally, you need accounting records for tax purposes. Whether you choose to keep these records on your own or find a professional to help is up to you. But, as the small business owner, it is vital that you understand certain business finance basics. Here are the five small business finance basics you should pay particular attention to. Revenue is the money coming in while expenses are monies going out of the business. You must always record these figures. For revenue, write down how much is coming in and where it’s coming from. For expenses, record how much was spent and what it was spent on. Very often, small businesses spend cash and later can’t account for the expenditure. It is important to record all transactions so you’ll have an accurate accounting of all business expenses at the end of the year. Two ways of documenting cash expenditures are to write reimbursable checks and keep detailed petty cash records. Receivables and payables are the heart of small business finance. They are what customers owe you and what you owe others respectively. It is important to record details of both. Note how much is owed, invoice dates, invoice numbers, terms of the agreement, dates, and amounts paid or due, and balance. More importantly, always keep this information current. In some cases, you may find that slow paying customers are negatively impacting your monthly cash flow. If this becomes a problem for your business, you have a number of options including applying for a traditional bank loan or line of credit or securing private funding. Invoice factoring is an increasingly popular option. 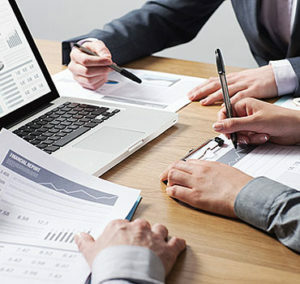 Invoice factoring, also known as accounts receivable factoring, provides your business with a fast cash infusion with no invasive approval process, no long-term commitment, and no limits on how you use the funds. If you hire even one employee, you must fulfill your duty as an employer by filing the required forms and contributing payroll taxes. Every state has its own tax guidelines so you should see a tax expert to find out what your specific obligations are. Two forms that you’re likely to be asked to maintain for every employee, regardless of the state in which you do business, are the W-4 and I-9. The final small business finance basic has to do with inventory. When tracking inventory, be sure to keep accurate records of purchase dates, purchase prices, stock numbers, sale dates, and sale prices. These records will help you better predict future trends because you’ll have past data at your disposal. You just need to analyze that data to uncover what the future might look like. Accurate inventory records will also help you keep inventory holding to a minimum. Do you have thoughts or questions about small business finance? Post a comment below to share them with us. Call us today at 800-297-6652 to learn how accounts receivable factoring improves small business cash flow. In the DFW area, call 972-404-4726. Dallas, Texas– For the third consecutive year, Top Ten Reviews has ranked American Receivable as the #1 factoring company in the U.S. American Receivable was one of the first factoring companies in the DFW metroplex, and for the last 39 years, American Receivable has provided cash flow solutions to businesses across the nation. American Receivable offers custom tailored working capital for each client at some of the lowest and most competitive rates in the industry starting at .8% with up to 95% advances. American Receivable offers a quick and seamless application process with no upfront or hidden fees. Clients can receive funding in as little as 24 hours and require no monthly minimums or maximums. American Receivable Corporation is excited to announce its biggest month of 2017. We welcomed twelve new clients for the month of April. We would like to offer special thanks to our sales team and network of bankers and brokers for all the April generated leads who helped make April successful. Here’s to a continued prosperous 2017!